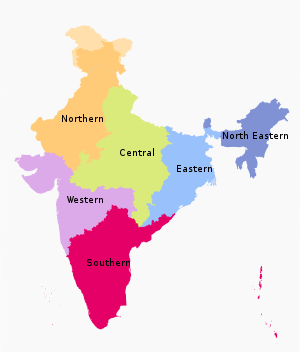 The Zonal Councils, five in number, were created under the States Reorganization Act, 1956 in wake of reorganization of the States in 1956 with the basic objective to develop the habit of cooperative working among the States, as well as between the Centre and the States and to provide a meeting ground for the States in different zones for solving inter-State problems and fostering balanced socio economic development of the respective zones. The Union Home Minister is the Chairman of all the Zonal Councils. The Office of the Vice-Chairman is held by the Chief Ministers of Member States of the respective Zonal Councils by annual rotation. The Chief Secretaries of the Member States function as the Secretary of respective Zonal Council, also by annual rotation. The Secretaries of the respective Zonal Councils are also ex-officio Chairman of respective Standing Committees, consisting of Chief Secretaries of all member States and preside over these meetings. (ii) Deal with matters arising out of the re-organisation of States such as, border problems, linguistic minorities, inter-State transport, etc. (vi) Deal with common problems like floods, drought etc. The Zonal Councils are especially meant for looking after interests of respective zone, they are capable of focussing attention on specific issues taking into account regional factors while keeping the national perspective in view. These Zonal Councils have also set up Standing Committees which meet from time to time to scrutinise the agenda items and to settle most of the issues at their level and only those matters are referred to the Zonal Councils which are of adequate importance considering the high level of these bodies. After the present Government coming into power in 2014, the Government gave an impetus to promote cooperative federalism. To achieve this, the Government energised the forum of Zonal Councils to make it an effective tool for regular interaction amongst the concerned States. For this purpose, a target was set for convening at least one meeting each of Zonal Council and its Standing Committee in a year. As a result, in the year 2014-15, 2015-16 and 2016-17 the meetings of the Zonal Councils and Standing Committees were held regularly. A large No. of issues raised both by the State Governments and the Ministries/Departments of Central Government were discussed in these meetings and roughly about 60% of the issues were resolved. Bringing about a Green and Blue Revolution in the East Zone, issues relating to Fisheries, Productivity of Livestock & Poultry, measures to combat Left Wing Extremism (LWE) etc. Issues relating to Security of Marine Fishermen and Coastal Security, issuance of biometric identity cards to marine fishermen and card readers, bringing back marine fishermen belonging to Gujarat languishing in Pakistani Jails, steps to check pollution in Damanganga and Kolak Rivers due to discharge of untreated effluents from the industries located in the Vapi Industrial Area of Gujarat etc. Sharing of Water & Power among the Northern States, curbing of air pollution in Delhi and NCR, need to check to smuggling of drugs and illicit firearms etc. Measures to combat Left Wing Extremism (LWE), improvement of airport infrastructure, need to increase density of highways/roads and upgradation of existing roads, etc.Southern Zone Uniformity in allocation of funds in proportion to population of SCs/STs for scholarship for all the courses, containing Maoists activities in tri-junction area of Tamil Nadu, Kerala and Karnataka, High Speed Rail Corridors and introduction of Peninsular Tourism trains etc. In addition, in June, 2016, Hon'ble Home Minister chaired a meeting of the Home Ministers/DGPs of all the Coastal States/UTs at Mumbai and reviewed the progress under the Coastal Security Scheme as well as issuance of biometric identity cards to fishermen & card readers etc. Central Ministries and concerned States/UTs were asked to take time bound action for completing issuance of bio-metric identity cards and card readers. The States were also asked to provide genuine mobile numbers of fishermen to Indian National Centre for Ocean Information Services (INCOIS) which will give information, relating to potential fishing Zone, Ocean state forecast, high wave alert, Tsunami early warning, dissemination mechanism etc. The Zonal Councils provide an important platform to resolve inter-State and Centre-State issues relating to States/UTs in a particular zone in an amicable and harmonious manner. The Zonal Councils are powerful instrument of consultation, conciliation, cooperation and consensus to resolve many issues, even ticklish ones.